Rooting into mother earth and calling on the spirits of nature and healing in trance, the dea genetrix offers us an opportunity for a restorative interlude in our busy lives. She reminds us as we move through these fall days that soon we will be in the dark months of the year. That welcome time for stillness, reflection and regeneration as we await the long night of winter's solstice heralding life's renewal in the sun of the new year. I awoke and rose early this morning, marvelling at the clear bright star studded sky waiting for the dawn to come. Soon after light came I sat with my back supported on my bed dropping deeply into supplicant requesting the presence of spirits of healing for my body. They came in gentle flowing form, almost ghostly, gathering around me and supporting my weight until I felt a sense of floating just above the surface of the bed. Then began a laying on of hands on the places in my body where there is stiffness and pain. I breathed into their healing touch, relaxing, softening and grateful for this space of time to feel held and tended. Beginning my walk I was very conscious of the rooting into this land that has developed over the time I have been practicing our annual collaborations here in my home community. My walk out into the dewy morning took me along the pathway through the meadow where I stood in the light of the full moon during my full moon dreaming in March 2015. Beyond the meadow my gaze rested on the great trees where I stood in awe drinking the light of the Beltane supermoon in May 2012 for my ancestral journey. My footsteps then led me out into the wooded park below where I spent the seasonal full moons of 2013-2014 encountering Alder, and on beside the stream where I encountered the spirits of the old ones in my Ancestral Journey at Samhain 2011. 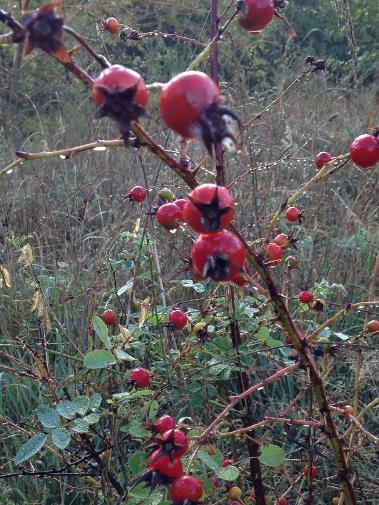 Today it seemed the nature spirits were alive with the delight of this beautiful fall morning. My heart lifted to be in the presence of the delicate beauty of dew dropped blades of rush and grass, shining fruits of rose and everywhere the cobwebs their filaments strung between stems and stalks. Cedar spoke to me of her healing powers, a small cut frond laying on the path caught my eye. I picked it up using it to brush my aura, sweep my body, refreshing and reviving me as the sacred touch of this ancient tree soothed into my awareness. Grateful to be in the presence of nature's healing powers, grounded in this land, so aware of the moving into dark that is upon us. I opened to the blessings of this warm sunny fall morning and turned my footsteps towards home. It is Canadian Thanksgiving. I awake early but I can't get myself out of bed. My whole being is tired. 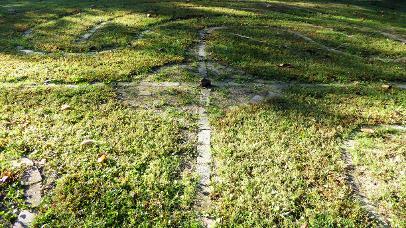 I think about walking to the grass labyrinth a few blocks from my home to do my MA pose. I know it will be a beautiful day but I still can't get myself to sit upright. I envision walking and finally I am able to pull myself out of bed. I make tea to-go and gather my camera and MA pose journal. As I walk I am aware of the morning bird songs. Arriving at the labyrinth I appreciate the moment of stepping off the pavement and onto the soft grass. Sunlight is beginning to peek its way through the trees and onto the grass. I step into the brick circle of the labyrinth just outside of its center. I stand on the bricks and look into the trees and bushes in font of me. 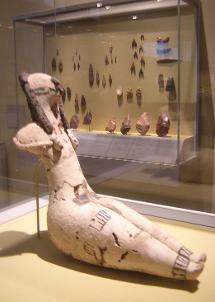 I settle into the rooted standing pose of the 'dea genetrix.' As I stand I notice my shadow beginning to appear across the labyrinth path. It is long and tree-like. The long form becomes more solid as the sun gets brighter on the grass. Then my shadow gradually shortens as the sun rises higher in the sky. I transform from a tree-like shadow to a human shadow form and step out of the small circle and begin to walk the labyrinth. Partway through my walk a fallen tree branch lays across the path. I stop and pick it up and rest its broken end on my hip. I continue my walk into the center aware of the branch now being an additional appendage to my body. I arrive at the center and begin to turn. My left foot connected to the earth in the center while my right leg propels my body counter-clockwise in a Sufi turning motion. My eyes focus on the branch while the environment surrounding me blurs. My tree appendage anchors me in the fast-motion-life passing so quickly by me. I stop, with mouth hanging open, air coming in and out of this open cavity; they remind me of death-like breaths. I turn to thoughts of dying. I begin to lay the branch down. The branch points out of the center of the labyrinth and as I bend down to lay it on the ground my eyes are directed to a tiny dead creature laying just outside the path that I did not notice on my walk in. 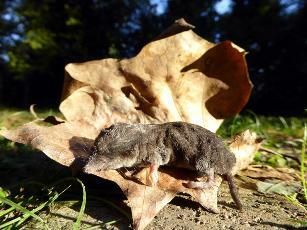 It is a tiny shrew. I go to it and notice its mouth gaping open, with the tiniest of teeth visible but no breath passing in or out. I delicately pick this creature up with a nearby fallen tulip poplar leaf and carry it to the circle of bricks. I lay this tiny breathless being in the sun soaked center. A small honouring of its life now passed. My life in contrast still has breath, movement and choice. I am reminded that we are in the earth cycle time of decay and death that I have not been consciously attuned to. I remember that the time of endings and retreating inward is here. And I have been living with much solitude in the midst of many people in my daily life, working. Working as a clan mother for others in the university system, caring for, mentoring, fighting. And I am in need of deep rest. In my re-attunement to death around me on this walk I grieve. I grieve for the death of eco-systems, the death of liberating educational systems, the death of trust in leaders, the death of intimacy in relationships. There is so much grieving work to be done and I am alive and still standing to do it. I chose to stand and not sit in this clan mother MA pose. I am in transition towards greater movement. A new position is waiting. What it will be I do not know. But letting go and grief are the preparatory work. I am in process of grieving many large and small deaths and I wit(h)ness them all. As I stand in this circle within the labyrinth I become aware again of the bird songs and the baseline chorus of cicadas beneath the songs. I leave the labyrinth with gratitude.